The Saccades Series is something I invented for myself. 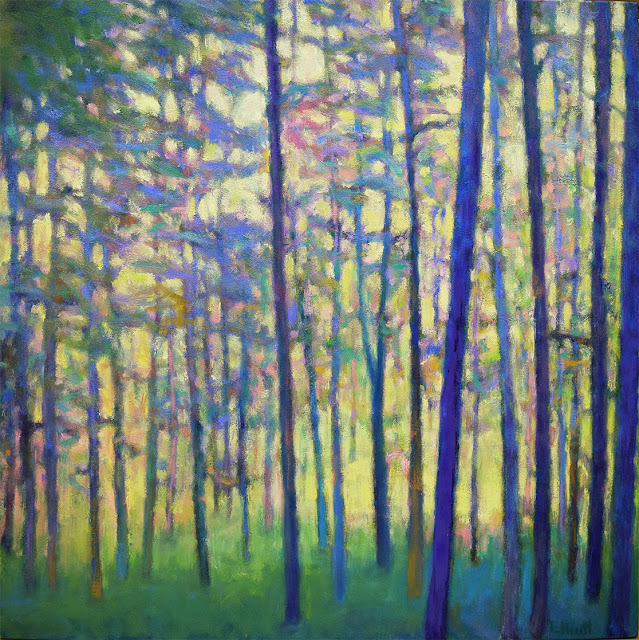 It is a way to use the randomness of the forest to create abstracted patterns and color combinations without limits. Each one presents a number of problems and opportunities that I haven't encounterd before and that's the point. Saccades is an optical term that describes a condition where the eye can't rest on a particular spot. In this case, there is that obvious blue trunk in the foreground, but it's not enough to create a real focus. The colors are arrayed in subtle ways and the light source is diffused, creating the overall effect of that soft yellow-green light enveloping everything in the background. The color palette shifted on this one numerous times but I did want the blue to be somewhat predominant. The light changed as well, from a darker, grayer forest to one with a more intense light coming through, but that was discarded as well. It is often said that the painting will tell you want it wants and over a series of painting sessions with this one, I was getting an earful. The oil and I opted for the soft poetry of a forest with the soft light nearby.